"I will start my operations here and pull the Rebels apart, piece by piece." Ready your fleet. The 2018 Star Wars™: Armada Store Championships are here! 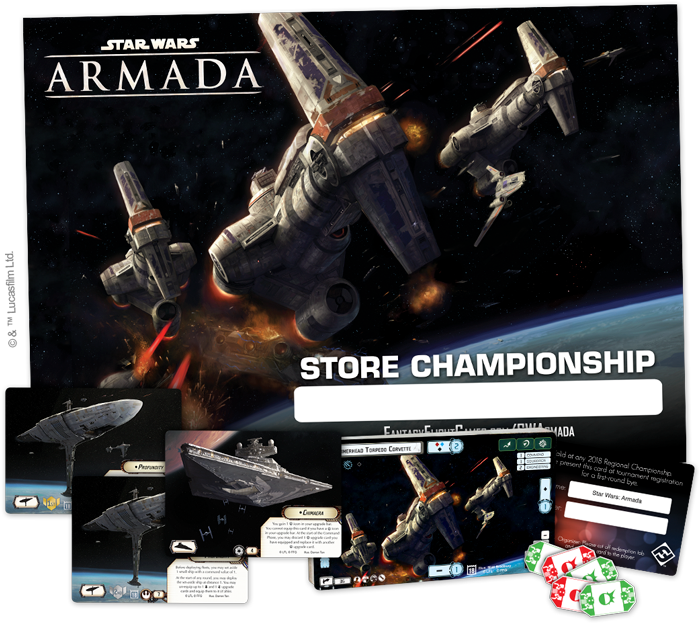 Each year, the Star Wars: Armada Store Championships take your in-store battles and amplify them. While you'll face the same strategic and tactical challenges you enjoy in your seasonal play, the Store Championships set these challenges against a bid for gamer glory—your chance to claim local bragging rights. Obliterate your friends' fleets. Outmaneuver your local Star Wars: Armada community. Seize your objectives. And you might emerge victorious as Store Champion—the year's top player at your favorite local game store. You'll also win prizes. The Store Championships match the heightened competition wih an arsenal of prizes that easily outguns those that come with the Fleet Patrol tournaments supported by the game's seasonal kits. The cool prizes at this year's Star Wars: Armada Store Championships extend well beyond the top tables, and they start with the alternate art Hammerhead Torpedo Corvette awarded to the Top 32 players at each event. If we learned anything about the Hammerhead Torpedo Corvette from Rogue One: A Star Wars Story, it's that you should never overlook the old ship. Under the command of a cunning admiral, one of these vessels can easily spell the difference between a successful engagement and utter disaster. With dynamic new art by Matt Bradbury, it's safe to say this particular Hammerhead Torpedo Corvette should spur you to plenty of imaginative new tactics. 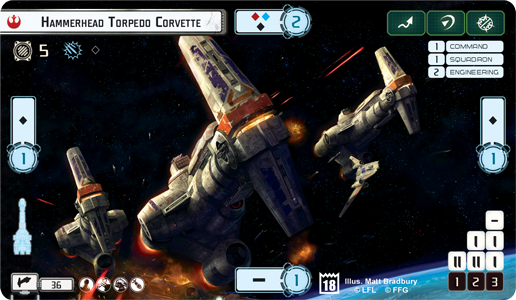 Given all the Hammerhead Torpedo Corvettes you'll find flying about the 2018 Star Wars: Armada Store Championships, you'll probably need to brace for impact at some point. And if you make the Top 4, you'll be able to brace more effectively than ever—with a set of five acrylic brace tokens. Damage is inevitable. The key to victory is making sure that you don't let that damage cripple you. Fly your way into the Top 2 at a 2018 Star Wars: Armada Store Championship, and you'll have proven yourself one of your side's greatest admirals—no matter if you're fighting for the Galactic Empire or the Rebel Alliance. 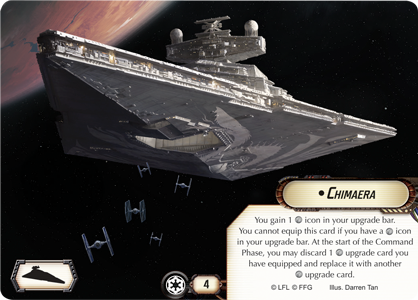 Accordingly, the Top 2 competitors at each 2018 Star Wars: Armada Store Championship will claim a double-sided plastic upgrade card, foil-stamped with your place—either 1st or 2nd. One side of the card bears the Chimaera title and its text; the other side allows you to fly your MC75 Cruiser into battle as the Profundity. No matter which of these great ships you fly to battle, it will bear testament to your skill, your accomplishments, and the faith invested in you by either the Empire or the Rebellion. Lead your fleet to victory, claim the title of Store Champion, and you'll have pulled together the final pieces of your gamer glory. As your favorite local game store's newly crowned 2018 Star Wars: Armada Store Champion, you'll have earned bragging rights for a whole year's worth of Organized Play, and you'll have set yourself on the fast-track toward success at bigger battles. 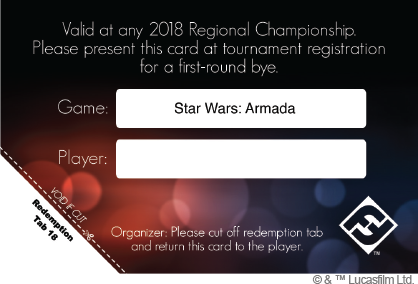 Your Store Championship earns you a 2018 Star Wars: Armada Regional Championship Prize Bye worth one free win and a direct shot at the top players in your Regional Championship's second round. 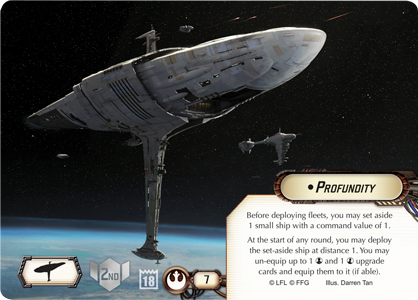 As the game of epic, large-scale fleet battles in the Star Wars galaxy, Star Wars: Armada demands that you learn how to plan ahead. Apply those skills now toward your involvement in the 2018 Star Wars: Armada Store Championships; talk to your local retailer to see when they'll be running their Store Championship tournament!